So there I was, standing about 15 feet from Mick Fleetwood of Fleetwood Mac, all that separated us were several beautiful women in skimpy attire. . .ahhh, the music business! NAMM is an acronym for the National Association of Music Merchants. It is an organization composed of various segments of the music industry, from manufacturers of the small metal corners on speakers to performing musicians. 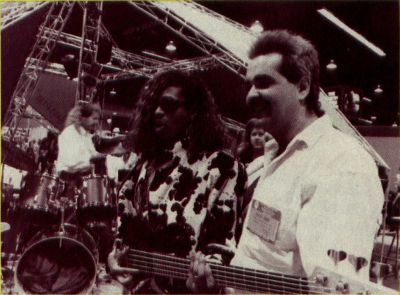 In 1989, NAMM members and invitees will gather three times to display what's new in music. The show I attended was in Anaheim, California, on January 20, 21 and 22. The second was in Frankfurt, West Germany, from January 28 to February 1; and the third show will be in Chicago, Illinois, from June 16 to 18. The show in Anaheim was the first one of 1989 and traditionally important in showing annual trends. The show was for the most part held in three large buildings with a total of over 300,000 square feet of exhibition space: nearly seven acres of new music gadgets! Upon entering the show mass confusion was the first impression. It was a literal carnival of light and sound, complete with performing sideshows. Some of the spectators were more interesting than the exhibits. People were dressed in everything from three-piece suits to leather webbing, both sexes in each. There were over 550 exhibitors at the winter NAMM show. 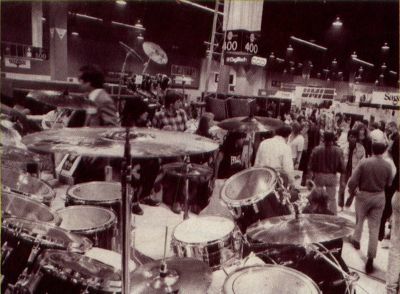 Though computers play an increasing role in the music business, they still accounted for only a few dozen exhibitors, however, that number would be much larger if MIDI instruments are counted as peripherals. 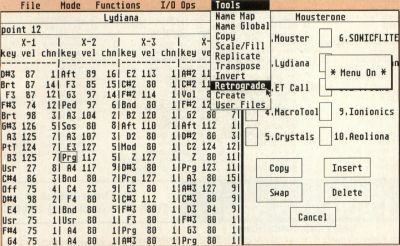 There was software for the IBM, Macintosh and Atari computers. Apple Macintosh had the physically largest display, with Atari a close second. I did not see a display area for the IBM PCs, an unusual situation in any other computer situation. 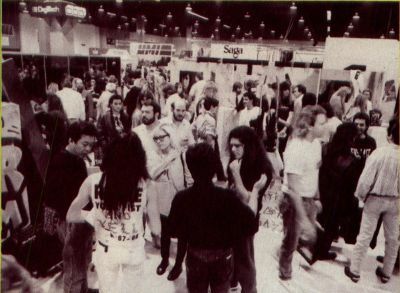 Though the Atari exhibit seemed less overwhelming than that of the Apple Macintosh, the Atari ST had the largest overall representation when the Atari booth was counted with all the software distributors who support Atari products. Space does not permit mentioning all the exhibitors or even all the software of each of the mentioned exhibitors. This is intended as a brief overview of a few products I found interesting. Dr. T's had a display booth of their own and a small station within the Atari area, as well. Such costly double exhibiting indicates great support for the Atari. Dr. T's has excellent software for the ST. Their KCS sequencing program functions as a 48-track tape recorder with lots of standard editing features. I believe it retails for around $200. 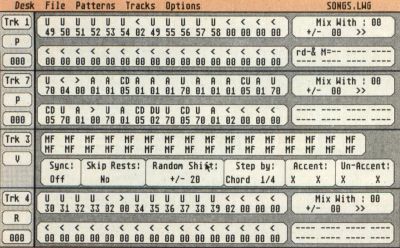 An added option is the Programmable Variations Generator (PVG), which allows previously recorded music parts to generate new ones with certain parameters such as pitch or rhythm varied. PVG also comes with a Master Editor, enabling very advanced editing features. Dr. T's low-end, entry-level sequencer is Midi Recording Studio V1.1, an eight-track sequencing program. Hybrid Arts Inc. had a space away from other exhibitors at the main entrance to the show. They had an impressive demonstration of their products set up within a mini-sound studio. They have both low-end products for beginners (like a sequencer called EZ Track + that retails for $55) and high-end, film-synchronization programs and hardware. MIDI does not record anything but MIDI instruments, so there is a market for devices which can digitize acoustic sounds and store them for later playback. These digitizing systems are hard-disk-based because of the immense memory requirements of such a system. Hybrid Arts was displaying these systems, ADAP I and ADAP II, but price ($1,995 and $3,495, respectively) will limit their use to only the most professional applications. Hybrid Arts also markets a librarian/editor program called Genedit that allows the editing and storage of sounds in all MIDI devices. Many other librarian programs are specific to a particular keyboard or MIDI device. Ludwig is a music composition program using algorithms to generate music sequences with random elements. In other words it composes music for you. Add a few changes of your own and a new Bruce Springsteen is born! 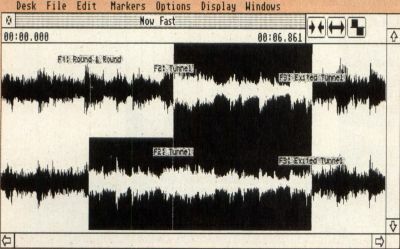 The most noticeable change in music software was the catch phrase "Multiprocessing environment" or MPE. Though it is often touted as something else, it seems to be essentially a switching environment for STs. With MPE a person can load more than one program at a time and then switch back and forth during a session without rebooting. This has practical applications in the music field, as one might want several of the basic types of programs loaded at once. Steinberg/Jones was showing an entry-level 12-track sequencer, Twelve, for $69 that has fairly impressive editing and display features, certainly worth a look if you want to get started. The beginning version is compatible with their top-of-the-line sequencer and should prove to be no transition problem later. Their 24-track sequencer, Pro-24 III, which is the next step up, is $350. Steinberg/Jones has a multiprocessing environment program called Switcher for $35, which they indicated would work with any programs. If you want to multi-task with an ST, you need Steinberg/Jones' Cubit. 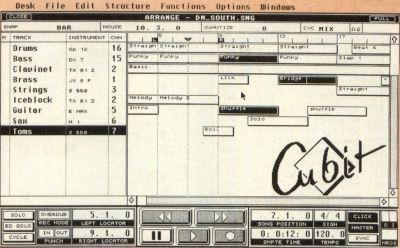 Cubit utilizes Visual Song Processing (VSP), essentially a method of sequencing and editing music using windows and graphics. The exciting part is its use of M.ROS, MIDI Realtime Operating System. M.ROS is an operating system that allows true multitasking on the ST! The price of Cubit is "to be announced." Another company present at NAMM was MIDImouse Music, showing a couple of truly innovative programs. Mousterpiece, written by David Carter, who was present to demonstrate it, is really a new musical instrument. Imagine a three-dimensional universe with a cursor centered within it. On each of the X, Y and Z axes there exists four tracks. The user can assign any music parameter, such as pitch or sustain, to any track on any axis. Up to twelve keyboard configurations can be played in three dimensions at once. In order to play the "instrument" created, one only has to move the mouse. As the cursor moves, it selects the music data corresponding to the location of the cursor in X, Y, Z coordinates. The sounds are amazing. Monster-piece ($229) also includes two sequencers and various editing features. The second attraction from MIDI-mouse Music was UltraMIDI ($229) by Darren Stevens. 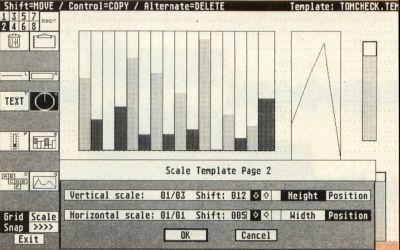 Again, the programmer was on hand to demonstrate the program. 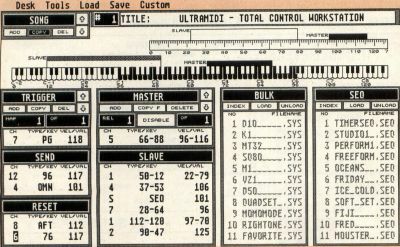 UltraMIDI allows a user to reconfigure their MIDI programs and instruments. Instead of using your computer keyboard to load a song or begin a sequence, you can assign that task to a key on your keyboard. UltraMIDI allows 255 maps per song, 255 masters per map and 255 slaves per master. 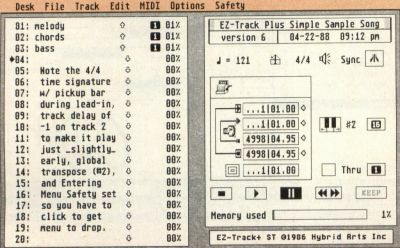 It allows macros to erase your sequences from memory after they have been played and has a runtime module to allow the playing of sequences by communicating with the LCD screen on many MIDI instruments, thus eliminating the need for a monitor. The last feature should appeal to working musicians who don't want a monitor present on stage or don't want to drag one around. The NAMM show is an absolute barometer of the music community. 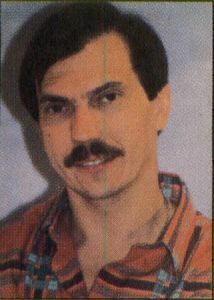 As such, it is clear that the Atari computer is a major force in that community and will remain so for some time to come. MIDI is an acronym for Musical Instrument Digital Interface, and is a universal standard for the transmission of musical data between electronic musical instruments. 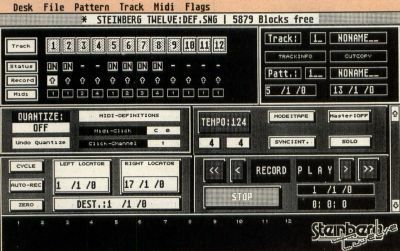 The MIDI standard was officially adopted at the 1983 summer NAMM Expo, although the standard has been revised a bit since then to iron out the bugs and add features. The standard specifications are available from the International MIDI Association for $35. Though the standard was originally implemented for transmission of data for music purposes, it is apparent that the standard could be used to transmit data for many purposes. It is already being used to control other aspects of concerts such as lighting and visual effects. 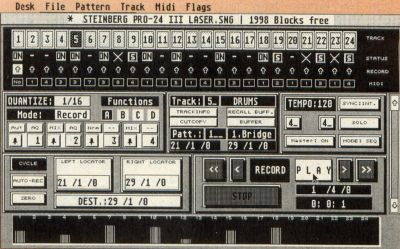 As computer technology goes, the MIDI standard is well established. Thousands of musical devices exist that utilize MIDI transmission. They are available in every price range. Most MIDI instruments are designed to communicate directly with each other without the need for a computer. For example, a keyboard can tell a rhythm machine to start, or one keyford can play several others. However, once a computer is placed in the circuit there is almost limitless control. Atari was an early pioneer of the music-computer interaction. The ST models have always come standard with a built-in MIDI interface and ports. The ST's have been widely used for music applications from their inception and continue to be a powerful tool for music development and performance. 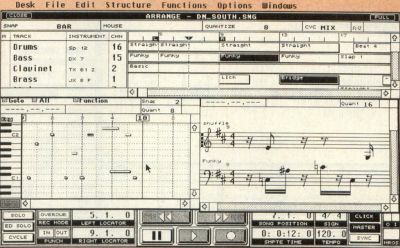 MIDI software may be placed into four basic categories: sequencing, librarian/editor, scoring and hybrid. Sequencing programs essentially memorize a note sequence played on one or more MIDI instruments, modify it in various ways, store it and play it back through a MIDI instrument. Sequencing parallels the traditional uses for multitrack tape recorders. Librarian/editor programs deal with the sounds within specific instruments. A keyboard synthesizer can be programmed to make the sound of a conceit grand piano, trumpet, oboe or footsteps. I recently pleased myself with the sound of a helicopter in a rainstorm! Many synthesizers have several "voices" and can emit many sounds at the same time. 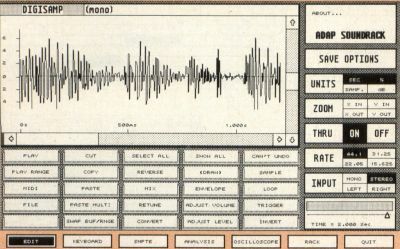 The librarian/editor programs utilize the computer to assemble various sound patterns and then store them for later recall and loading into instruments. Scoring programs produce written music from music played into the computer. 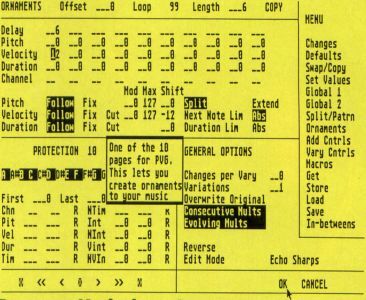 Most programs also display it on screen in standard music notation, allow it to be edited, and then print out sheet music. Amazing stuff. 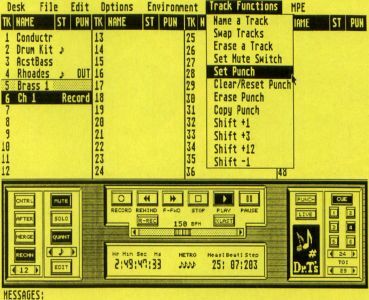 The last category of MIDI programs is comprised of hybrid and novel uses of the MIDI standard. This category is probably the most exciting in terms of an expanding future for the Atari computers and music. E. Brian Chernecke boots his ST in Southern California, where his diverse business and personal interests keep him searching for more and more application programs. He has been involved in the music industry for over ten years.